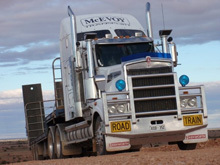 McEvoy Transport is accredited with National Heavy Vehicle Accreditation Scheme - Maintenance Management, Mass Management and Fatigue Management, Primary Industries and Resources South Australian Meat Hygiene Unit, Dangerous Goods licenced and are members of the South Australian Road Transport Association. We are continually upgrading our equipment with a strong emphasis on a sustainable and well maintained environmentally friendly fleet. 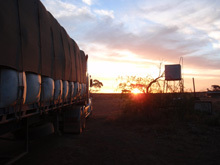 McEvoy Transport provides assistance to many levels of the community in which we operate within. Each year support is provided to local clubs, groups and events within this region. Since 1990, we have been major supporters of the Annual Oysterfest held at Ceduna. We have a mutually respectful relationship with local Indigenous groups within the community. We continue to support and liaise with local members on various levels at all times. Our dedicated employees are trained and committed to delivering a high quality of service to our customers.